The late Eocene Florissant fossil beds are world-renowned for their delicate plant and insect fossils and huge petrified redwood stumps. This field trip to Florissant Fossil Beds National Monument will provide an overview of the monument’s history, from the early geologists and paleontologists to the homesteaders who collected the first fossils for science, through the decades of commercial operation of two rival “petrified forest” concessions, to the establishment and operation of the national monument. The prolific scientific history of the site’s study extends back 140 years, beginning with the Hayden Survey. Less known—yet recently revealed in the new book Saved in Time—is the history of the lively legal battle to establish the national monument in 1969, which set new precedents during the infancy of environmental law. 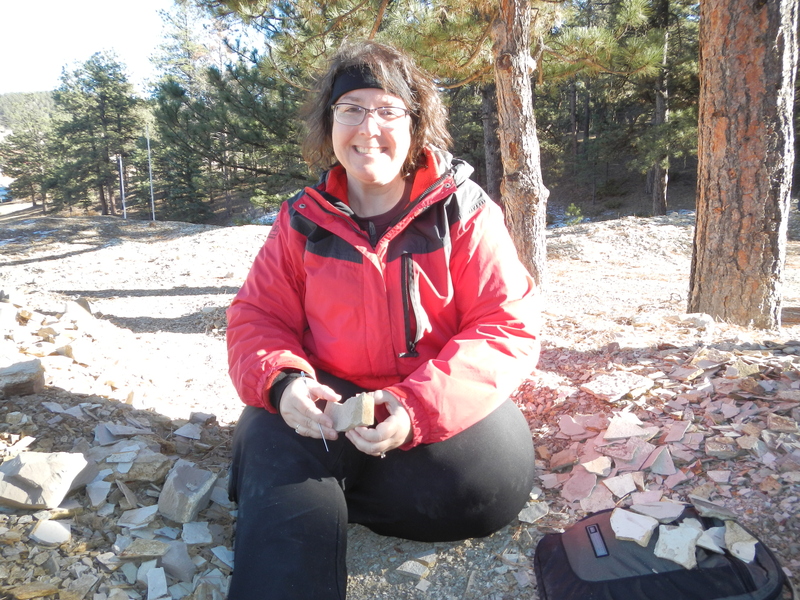 We will also discuss the scientific significance of Florissant’s geology and paleontology, emphasizing ongoing research as a focal point of the monument’s mission. Highlights of the trip will include a tour of the new paleontology lab and exhibit hall in the facility that opened in 2013, a one-mile walk through the historic Petrified Forest area, and fossil collecting at a privately owned fossil quarry. I met with the fieldtrip group (~25 of us from at least 5 different countries) at the Convention Center early Thursday morning for our 2.5 hour drive down to the town of Florissant (and I learned the name came from the French term for “flowering”). I won’t detail all that can be viewed at Florissant Fossil Beds National Monument – the geologic history is detailed online, and it is difficult to put in to words the size and scale of the petrified redwood stumps along the trails, and the very informative educational display with insect fossils in the visitor center. As this fieldtrip was part of GSA’s 125-year anniversary meeting, the fieldtrip emphasized the history of what it took for this piece of land to become established as a national monument. This was an incredibly fascinating history! The history section of the NPS website does not do the story justice. Florissant Fossil Bed’s journey to becoming a national monument was one of the nation’s first environmental cases that was a conflict between land developers and passionate citizens (including a group of women dressed in high heels and pearls that were ready to stand in front of a bulldozer to stop the construction from taking place!). I picked up a copy of the book Saved in Time: The Fight to Establish Florissant Fossil Beds National Monument, Colorado, and I look forward to reading the full history, including the connection to Disneyland. After our time in the park, we headed to the Florissant Fossil Quarry, located outside of the park boundary. This private property was determined to be located too close to the downtown of Florissant to be included when the park lines were drawn back in 1969. The family that owns this property allows groups to come and dig through their beautiful outcrop of the lower shale unit of the Eocene-aged Florissant Formation. We had just under an hour to spend going through the piles of paper shale to see what we could uncover. I found some cool leaf fossils and plant fragments – now we’ll see if these delicate samples can survive the plane ride home! It was a great day outdoors in the field with a great group of people. Learning the history of one part of our public lands was really informative, and I can already see where I can bring my time today at Florissant to my classes. I think I need to do GSA fieldtrips more often! 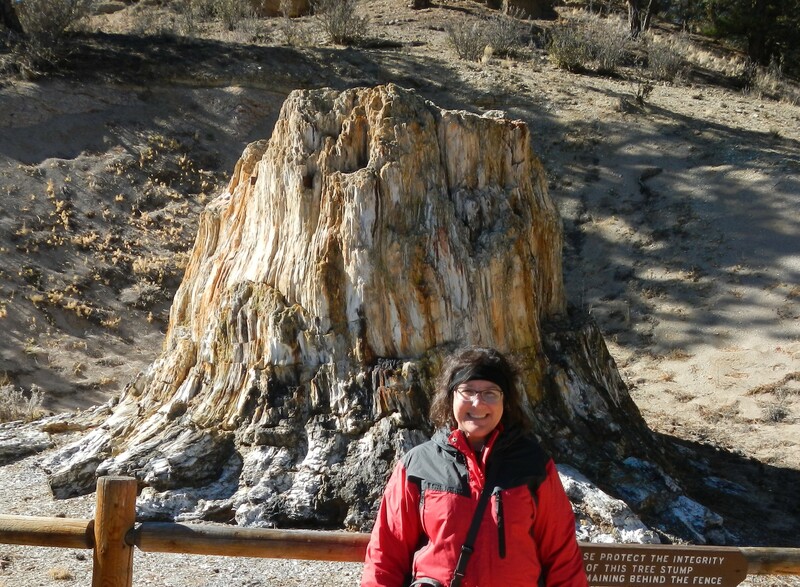 That’s me, standing in front of Big Stump – not the biggest “stump” in the park, but still 38 feet in circumference!